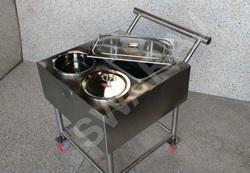 Manufacturer of a wide range of products which include stainless steel serving trolley and serving trolley. Owing to our extremely talented team of professionals, we are engaged in offering excellent quality Stainless Steel Serving Trolley. Used for serving food to the guests and customers, offered trolley is manufactured using top notch quality components and advanced technology in line with industry norms. Our quality examiners test this trolley on varied parameters so as to maintain its quality. Being leading manufacturers of quality commercial kitchen equipment we are providing best solutions for Serving Trolley, Dining tables, Food Warmers, Bain Maries etc. 2. Five & Six Vessel Trolley. 5. Waste Plate Collection Trolley. Note: Trolleys are provided with Heavy Duty Wheels (Castors) with SS or G.I Bracket as per requirement. 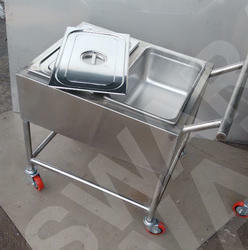 Looking for Serving Trolley ?